Bruce Anstey retained his SES TT Zero title with victory in this afternoon’s race at the 2017 Isle of Man TT Races fuelled by Monster Energy. The popular New Zealand rider was never headed and won the race in a time of 117.710 (19:13.924) from his Mugen Shinden teammate Guy Martin (113.632/ 19:55.331) with Nottingham University’s Daley Mathison (109.209/ 20:43.748) taking the final podium place. Dean Harrison, competing for Belgian team Sarolea who achieved their fastest lap with a time of 108.064mph and won a bronze replica, finished fourth in 108.064/ 20:56.924. Anstey had already established a commanding lead of over 10 seconds from Martin by the first checkpoint at Glen Helen with Mathison 14 seconds back in third but already establishing a 2 second gap over his nearest challenger Harrison in fourth. By Ballaugh Anstey’s lead had stretched to 18 seconds from his Mugen teammate although Martin clocked the fastest time through Sulby speed trap with 162.9 to the Kiwi’s 162.1. The time was noticeable as it was faster than any of the Lightweight times through Sulby during the previous day’s race. By Ramsey Anstey’s was a decisive lead of almost thirty seconds from Martin with Mathison maintaining third from Harrison. 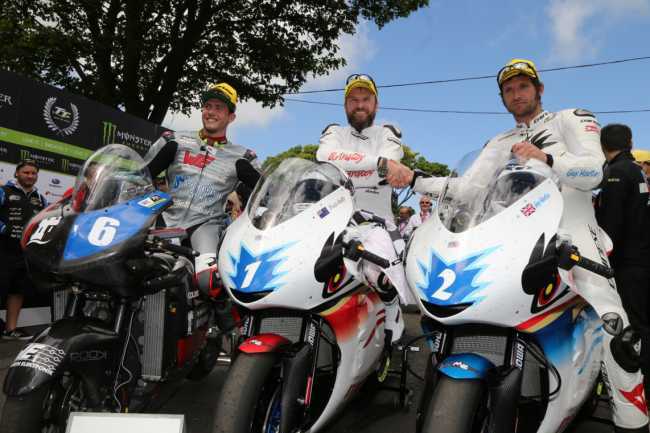 Anstey maintained a healthy lead over the nine mile Mountain section and duly brought his machine home to win the race from Martin with Mathison claiming University honours in third and Harrison getting the Sarolea machine over the line in fourth after last year’s disappointment. The returning Spanish rider Antonio Maeso brought the second Nottingham University machine home in fifth in a time of 91.197/ 24:49.385 with James Cowton for the Brunel University team in sixth in 90.963/ 24:53.229 , Adam Child on the MCN Moto Corsa seventh (78.848/ 26:42.662) and Matthew Rees (77.415/ 29:14.549) racing for Bath University in eighth. The race was notable for the fact that all eight starters finished this year’s race.